"Not much of a new world is it?" 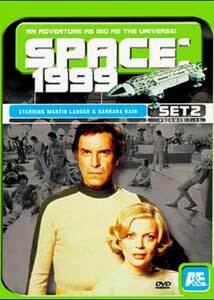 With the release of the first two dual disc sets of Space: 1999, we now have half of the first season of this 1975 TV series available on DVD. The larger budgets used for these shows is evidenced by the amount of set work and miniatures utilized in the series. More encounters with malevolent forces of the universe confront the crew of Moonbase Alpha as they search for a new home after being blown out of Earth orbit. While the costume styles may look dated now, they were pretty high tech in their day, as were the gadgets used routinely throughout the show. Though stretching scientific credibility most of the time, the fantasy factor is still entertaining, as long as one can overlook obvious technically unsound principles used as plot points. In Missing Link Commander Koenig (Martin Landau) suffers near fatal injuries after the crash of Eagle 6. While his friends on the moon try to save his life, he finds himself - completely intact and healthy - transported to the Zenno, a planet five million light years from earth that consists entirely of light. Peter Cushing makes a guest appearance as Raan, a scientist looking to keep Koenig for study as a link to his people's past, but as Koenig's moon body comes ever closer to death, it may be Raan's daughter Vana (Joanna Dunham) who holds the answer to the Commander's dual existence, of which only one can survive. This episode rates 4 out of 5 moons. Catherine Schell, who would join the cast full time in season two as Mia, makes her first appearance in the series as the Guardian's Servant in the The Guardian Of Piri. As the moon approaches another possible candidate for settlement, an Eagle reconnaissance crew disappears. The main computer seems to be malfunctioning, and while testing it, David Kano (Clifton Jones) vanishes into thin air. After discovering that the Eagle hadn't crashed as expected, Koenig and Carter (Nick Tate) descend to the surface to investigate, and here Koenig meets the Guardian's Servant, who explains that Piri is perfect for them to live on. When the Alphans decide Piri will be their new home, only Commander Koenig sees through the façade presented, but is he too late to save his crew? A strange blue light appears from space in Force Of Life, and after a moment when the entire moonbase crew is caught in suspended animation, reactor technician Anton Zoref (Ian McShane) is found unconscious. His medical exam turns up nothing, but the testing equipment fails. When Zoref returns to his quarters, his wife Eva (Gay Hamilton) complains about the heat, while Zoref is freezing. Another medical call to the reactor center finds Zoref's partner dead, frozen stiff. Koenig and Professor Bergman suspect the light anomaly and begin to realize that this force is now amongst them, draining the energy from the base. What will it take to stop this force, and how many lives will be lost in the process? The crew is ecstatic when the first child is born on Alpha, until they find out that Cynthia Crawford's (Cyd Hayman) child has grown to the size of a five-year-old in his first day alive! After her husband's unexplained death (six months previous), the investigation is reopened to try to find a cause for this bizarre occurence, which has left a deaf and mute, yet incredibly intelligent boy in their midst. Then, when a group of alien spacecraft gather menacingly over the base, Koenig and company face another unknown in Alpha Child. As the moon enters another solar system, there is the possibility of finding a suitable planet for the moonbase occupants, but when their probe, Eagle, returns with a mysterious device attached to it, the intent of the planet's occupants is unclear. Suddenly, the device starts emitting vast amounts of oxygen, which develops into a breathable atmosphere. More devices land and for the first time rain appears on the moon. With a climate similar to Earth's and the projections that the moon will fall into orbit around the sun, the Alphans have the world they have been looking for at their doorstep. Has Utopia really been found? Find out in The Last Sunrise. It's a race against time in Voyager Returns.The Alpha crew discover a relic from Earth's past, a deep space probe containing 15 years worth of data from around the galaxy including charts of planets that may be suitable for their settlement—if they can retrieve it. Unfortunately, the ship is equipped with a Queller Drive, which spews neutron particles in its wake, annihilating any and all life in its path, and it is on a direct course for the moon. Only one man can stop it, but more surprises await them when another object is detected coming their way. Image Transfer Review: Like the first set, the image quality on these two discs is impressive most of the time. It is usually the model shots that suffer from any aliasing or other compression issues, though some of this may be in the source, and just more noticible at higher resolutions. Colors are well-rendered, the film grain looks natural, and source damage is nearly nonexistant. Alpha Child did exhibit some unnatural changes in sharpness between scenes, probably due to sources from different masters. Audio Transfer Review: The English mono track sounds fine for a show over a quarter century old. Frequency bandwidth is limited, but doesn't detract from the experience. No noticible distortion or other anomalies are present. Extras Review: Like the first set, the extras include still galleries with behind-the-scenes images from each episode. Set 2 is housed in a lime green box fitting of its mid-seventies origins. The two discs feature the same insert card as the first set, which lists the 12 episodes available in wave one of the series. For fans of the show or those interested in 1970s science fiction series, Space: 1999 is well presented if a bit short on supplements. With over five hours of programming on each set, they are also a decent value, and should keep you occupied until the next pair of box sets arrive. The Eagles have landed. Thumbs up!